On the road from the fort …. I saw a wagon — tolerable good but heavy — bacon, beans, stoves, chairs, iron wedges, crowbar, soap, lead, ovens and many other articles all laying about in the prairie. They could not use them and they could not carry them, and the only alternative was to leave them. That was the extent of most everyone’s knowledge. The trail in 1841 was barely a track worn along the Platte River by the pack-mule and cart caravans of the Rocky Mountain fur trade. Hopeful greenhorns would have no beaten wagon road to follow over plain and mountain to California or Oregon. No useful map of the route existed. Emigrants would find no road signs, no bridges or ferries at river crossings, and no place to replace exhausted oxen and food supplies. The 68 souls who first set out with John Bidwell into that arid unknown have been praised as bold visionaries and spurned as risk-taking fools. Whatever they were, they were lucky. 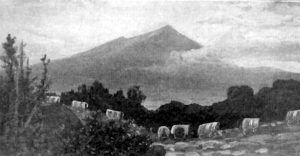 A few days out of Independence, Missouri they managed to join up with Thomas “Broken Hand” Fitzpatrick, who was already guiding a company of missionaries to the Pacific Northwest. 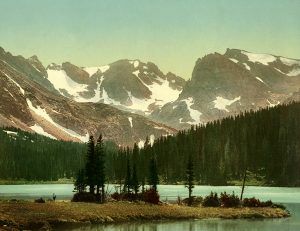 The famous mountain man agreed to take the emigrants along the Platte River and through the Rocky Mountains as far as the Fort Hall area in present-day Idaho. From there, they would have to find their own way. Amazingly, they did. The way Fitzpatrick took his pilgrims — on the old trappers’ route up the North Platte River into central Wyoming, up the Sweetwater River and over South Pass — became the corridor of the combined Oregon, California, Mormon, and Pony Express Trails. Government maps of the route published in 1843 and 1845 gave others the confidence to set out for the West. Within a few years, a rising stream of emigrant wagons had beat the old “fur trace” into a road that the greenest tenderfoot could follow. 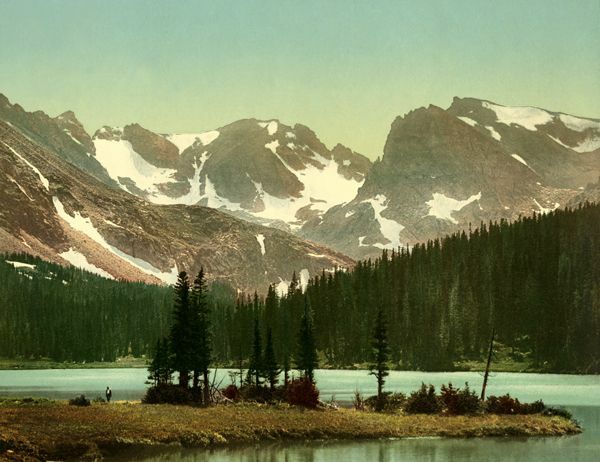 The heart of the Rocky Mountains by the Detroit Photographic Co., 1901. Most emigrants agreed that the easiest part of the overland trail was the 500-mile stretch that followed the Platte River across Nebraska’s prairie. The country grew rougher and the scenery more wonderful as the wagons rumbled up either side of the Platte River’s north fork, past Chimney Rock and Scotts Bluff, and into Wyoming. In the vicinity of present-day Lingle. The trail crossed an undistinguished grassy flat where an 1854 shootout between Sioux and soldiers, known as the Grattan Fight, would unleash the bloody Plains Wars. A shallow mass grave and grisly artifacts marked the battle site for the continuing emigration. By the time travelers reached that sober milestone, they had been six to eight weeks on the trail. Their enthusiasm for wayside points of interest was demeaned by the weary rhythm of the road: rise before dawn, cook, clean up, repack, gather and yoke the oxen … and then plod through the dust all day to set up another camp about 12-15 miles up the road. Fort Laramie, 50 miles west of Scotts Bluff, Nebraska, provided a welcome break from the tedium. In 1841, when the Bidwell-Bartleson Party stopped in for a two-day layover, the fort (then called Fort John) was a simple adobe trading post bustling with fur traders, trappers, Plains Indians, and adventurers. Eight years later, the U.S. Army purchased the establishment for a military post to protect and help re-supply the ever-increasing overland traffic. Fort Laramie soon grew into a busy community of soldiers, army wives, laundressses, children, servants, and quartermaster employees. Teepee encampments settled in and around the fort, which became a multi-ethnic “travel plaza” on the overland highway. There, emigrants could post their mail, repair wagons, shoe livestock, and shop for necessities (and liquor) at the post sutler’s store. They also could visit and trade with the fort’s Indian residents — a thrill that many emigrants recorded in their trail journals. 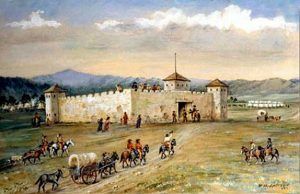 Most travelers approached Fort Laramie from the main Oregon and California roads along the south bank of the North Platte River. This required fording a tributary, the Laramie River, just east of the fort. Today, dams have tamed the Laramie River, but, in the mid-1800s the river’s spring current sometimes toppled wagons and drowned emigrants and livestock. Looking for the safest places to ford, travelers used at least nine different crossings of the Laramie River, and bridges and ferries eventually served some locations. In the early years of the emigration, the terrain on the north side of the river was thought to be impassable west of Fort Laramie. 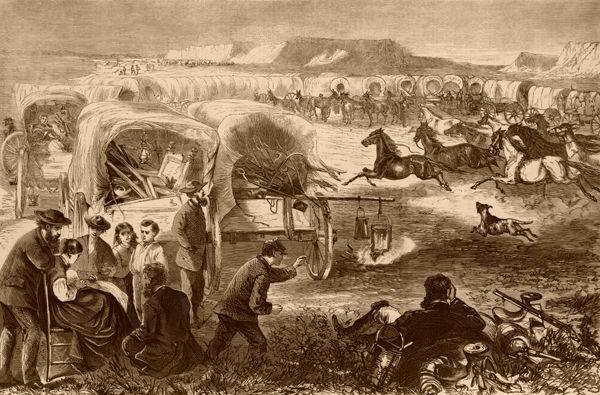 Mormon emigrants and others entering Wyoming on the north-bank road were forced to ford the deep, swift North Platte River near the fort. Starting in 1850, north-side emigrants had the option of loading their wagons into ramshackle flatboat and pulling the contraption along a rope stretched across the river — unassisted, and at the outrageous fare of $1 per wagon. The price of passage drove some offended emigrants to blaze a new trail, Child’s cutoff (also called Chiles’s Route), which continued west on the north side of the river. Travelers who stayed on the north bank via Child’s Cutoff could avoid crossing the North Platte River altogether, while those following the original south-bank road had to cross upstream, near present-day Casper. By 1852, most wagons arriving on the north side continued up Child’s Cutoff, though many travelers still crossed the river to visit Fort Laramie. A graceful iron military bridge, built in 1875, still spans one of four emigrant crossings of the North Platte River near the fort. Sparkling placidly beneath the bridge, the river strikes today’s summertime visitor as a mere pleasant wade, unlike the fearsome mountain torrent of 150 years ago. Regardless of whether the pioneers traveled to the north or south of the river, Fort Laramie was a major milestone, sitting at the edge of the western plains where the land begins to lift toward the slopes of the Rocky Mountains. West of the fort rose the blue-gray beacon of Laramie Peak, looking “like a dark cloud on the western horizon,” according to John Bidwell. 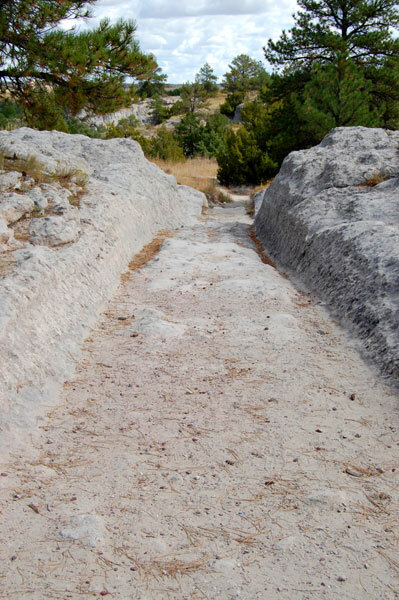 The steepest, roughest, driest, and most dangerous stretches of the road lay ahead. Travelers paused to lighten their wagons by selling unnecessary items — tools, books, clothing, furnishings, even wagons, and food — at Fort Laramie, but, buyers were scarce. Most disappointed sellers simply destroyed or dumped their possessions along the trail and moved on. Forty-niner J. Goldsborough Bruff saw “bacon in great piles, many cords of it” and a “diving bell and all the apparatus” among the items abandoned in the Wyoming dust. Ten miles northwest of the army post, travelers on the south side of the river reached their next campsite, called Sand Point, near today’s Guernsey, Wyoming. (In 1860-61, the Centre Star Pony Express station was also located here.) Some paused between endless camp chores to carve their names into the soft stone face of Register Cliff. A few miles beyond, the wagons fell into a single file for a hard pull up a rock ridge, avoiding boggy ground nearer the river. Thousands of iron-shod hooves and wagon wheels gradually cut a vertical-walled channel deep into the stone, at a site now known as the Guernsey Ruts or Deep Hill Ruts. The trails followed the arc of the North Platte River deep into central Wyoming. Once wagons started taking Child’s Cutoff, profit-minded men established toll bridges and ferries at several locations between Fort Laramie and present-day Casper. These allowed wagons to zigzag back and forth across the river to avoid sandhills and other difficult spots. At Casper, the river curved southwest across the emigrant route, forcing those on the south side to make a final crossing there or a few miles further west near Red Buttes (now called Bessemer Bend.) And, that was the end of the Platte River lifeline that had conducted the emigration across hundreds of miles of prairie and plain. Now, the need for water and grass would become a nagging worry. A short distance beyond the last crossing of the North Platte River at Red Buttes, all the trails came together for the hot, hard haul over Devil’s Backbone (also known as Avenue of Rocks) to the next good water at Willow Spring. Along this stretch, travelers on all the trail variants and cutoffs of the Oregon, California, and Mormon Trails merged for the first time into the same road. Now their teams faced a long pull up Prospect Hill, where wagon wheels wore multiple ruts and swales that are still visible today. Two miles farther was the next watering hole for the thirsty oxen: an odorous alkali marsh called Clayton’s Slough, jokingly named after an 1847 Mormon pioneer who had nothing good to say about the place. Hardworking oxen (and people) that drank too deeply of the alkaline water often died of digestive upsets and dehydration. Good water was available about four miles further west at Horse Creek, where a Pony Express station stood in the 1860s. From there, the road stretched another ten dry miles to the Sweetwater River. Grass was scarce all along the route. This leg of the trip, Emigrant Gap (today sometimes called the Poison Spider Route), was a bitter introduction what lay ahead: long stretches of hot, hilly trail with little feed for the animals, punctuated with stinking, toxic alkali waterholes. That poisonous 30-mile stretch between the North Platte River and the lovely Sweetwater Valley would kill many an ox and emigrant through the overland trail years.